In addition to gathering data to rank the Top 100 logistics service providers, a brief survey was conducted amongst participating logistics service providers. In a recent article published by logistiek.nl, Kees Verweij, a partner at Buck Consultants International, presented the findings. 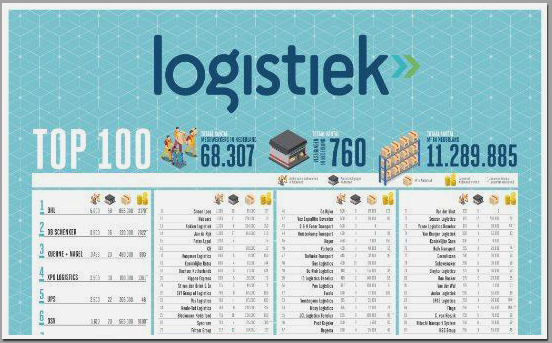 The Top 100 Logistics Service Providers 2017 survey, which was carried out by Logistiek.nl and Buck Consultants International, included several questions that were also asked in previous years’ surveys. Evaluation of this data elicited several key trends. In total, 78 logistics service providers and freight forwarders participated in the survey in 2017, compared to 81 in 2016. Of the participating respondents, slightly more than the half (52%) held a management function, while most other participants indicated being responsible for business development (36%). The first interesting finding of this year’s survey was a conspicuously sharp increase in transport volume noticed by respondents since 2016. In 2016, 47% of respondents noticed a strong upward trend compared to 38% in 2015, and just 15% three years ago, in 2013. This strong uptake also corresponds to data published by CBS, the Dutch Central Agency for Statistics, especially within the national road transport sector. Dutch lorries transported a total of 529 million tonnes national in 2016, an increase of 4 per cent, while the increase in international transport was ‘merely’ 2.5 per cent. In short, both volume, and optimism have been increasing more in the past few years than four years prior – a clear indication that the Dutch logistics sector is significantly better off in 2016 than it was in 2012. Another question in the survey asked respondents to indicate the most important areas for opportunity and the most important focus-areas encountered during day-to-day logistics activities. Commercial and customer areas were most often indicated as both the most important opportunity (29%) and the main focus-area (39%). Logical, when considering the fact that for a logistics provider, differentiation is essential to customer retention, as well as to attracting new customers through for instance, tenders. Many of the top 100 logistics service providers are highly customer-oriented, and will often even adapt their operating processes and systems to better suit the needs of their key clients. 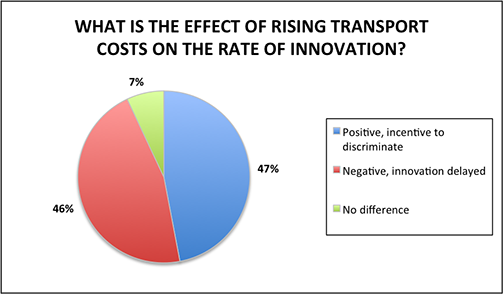 It is interesting to note that a quarter of surveyed logistics service providers (25%) saw innovation as the key area of opportunity in 2016. This is much higher than in previous years, when service providers saw greater opportunity in differentiating within the market. It is therefore likely that, in 2016, innovation is perceived by logistics service providers to be the best road to achieving differentiation for the customer. Other key focus areas and areas of opportunity indicated by participants were Service Level – 19 and 16 per cent, respectively – and employees (15% and 12%). Innovation was named as the key focus for 2017 by a quarter of logistics service providers. 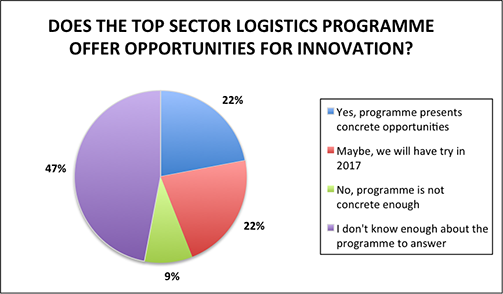 But what innovations have logistics service providers deployed within the logistics process in 2016, and where do they see opportunities for 2017? According to survey findings, in 2016 (18%) and in 2017 (21%) most respondents saw, and continue to see opportunities in the use of ICT-platforms, for instance for applications in sales and operations planning. In practice, these platforms often become the basis for more intensive cooperation with shipping agents. In second place: the rise of web-based transport orders and the continued re-organisation of distribution (16% and 15%, respectively), and in third place: the redevelopment of logistics processes (14% and 13%). The key difference in the responses of logistics service providers from 2016 to 2017 are the possibilities companies see in the use of big data for the optimisation of logistics processes – 13% in 2017, compared to only 8% in 2016. Big Data presents opportunities for innovation in the logistics process, and although this has been mentioned frequently by respondents in recent years, it has yet to see a break through. The same is true in 2017. In contrast, horizontal cooperation with colleagues was considered to be relatively less important – 8% in 2017 compared to 11% in 2016. Conclusion: a deceptive calm before the storm? In comparison with 2016, results in 2017 did not differ greatly. There were virtually no major acquisitions in the sector, in contrast with a few years ago. Additionally, within the top 100, there were fewer business terminations than in previous years. This is also consistent with economic growth in 2016, and the associated increase in logistics volume. Despite this, the fact that no major changes have taken place does not mean that logistics service providers will be able to quietly consolidate their activities. The conclusion is much different from that of last year: it would seem the sector is in a calm period before a coming storm. Various parties from outside of the sector, such as Amazon and Ali Baba, are committed to establishing physical logistics networks by investing in shipping and air transport, as well as in distribution all the way through to the end-customer. In this respect, Amazon is already advanced in southern Germany. What is to say that this will not happen in the Netherlands? Because of the intricate nature of the specialist network in the Netherlands, the trend will likely be less rapid here, but there is little reason to believe that a country like Amazon would not consider entering the Dutch market. This paints a picture of a ghostly future for the logistics industry in the coming years, because changes can be sudden, and serious. Fortunately, the top 100 logistics service providers can look forward to ever more opportunities to develop new logistics services through innovation. In this manner, they can continue to distinguish themselves and charge full steam ahead with the changing weather of the logistics market in the coming years. This article was originally published in Dutch on Logistiek.nl. To view the original article, click here.